The peaceful nature of the mid-day rest is captured gracefully by Van Gogh in his masterpiece “Noon: Rest from Work”. Contrasting & colorful, it brings out the very best of his creative genius. "My credit card blocked an oversees purchase at first but that was the only hurdle. I experienced excellent service and love my Van Gogh reproduction in my livingroom! - Nicholas Coyle"
We have successfully reproduced Van Gogh's “Noon: Rest from Work” while trying to capture the magnificence of the artist and his creative touches as far as possible. You can be rest assured that your picture would not look much different from the original one at least to a casual viewer. 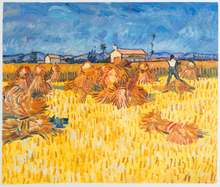 Van Gogh painted ‘Noon: Rest from Work’ during his stay in Saint-Rémy de Provence. 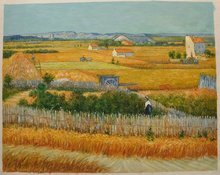 He took inspiration from the creative arts of Millet as he had done several times earlier but he did not forget to add his creative touches in the painting. “I am using another language” he wrote to his brother, explaining the reason why he relied heavily on the works on Millet’s La Sieste while painting this particular artwork. 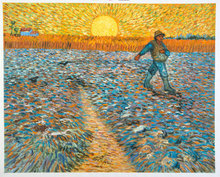 The painting, strangely enough, had never been named by Van Gogh, at least formally. So, when it got published, different publishers coined different names to describe the painting. 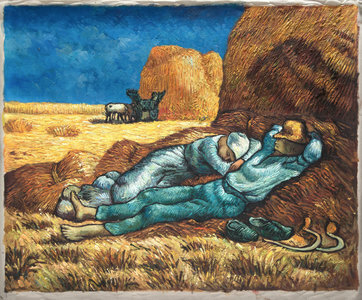 However, the most popular of them all are these two – ‘Noon Rest’ and ‘Noon: Rest from Work’. My credit card blocked an oversees purchase at first but that was the only hurdle. I experienced excellent service and love my Van Gogh reproduction in my livingroom!